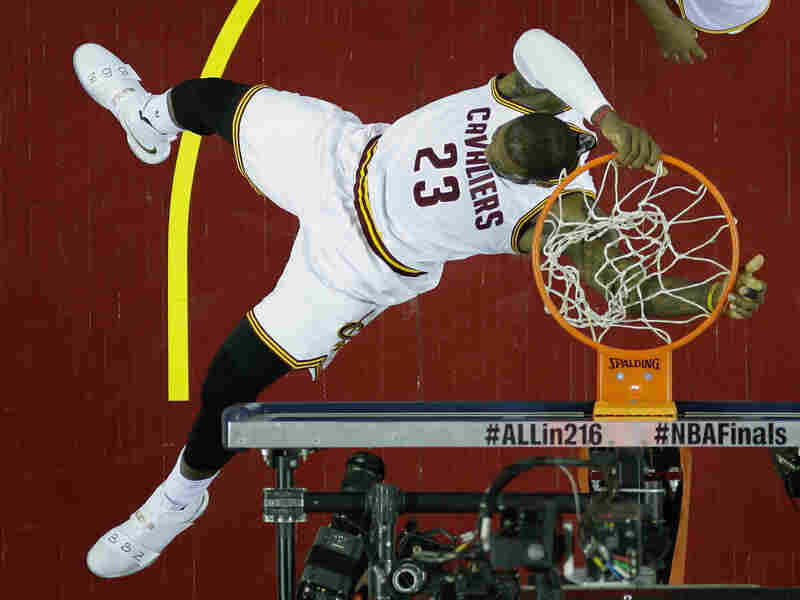 Cavaliers Sprint Out To Start Game 6, Hold Off Warriors To Force Game 7 : The Two-Way Cleveland, pursuing its first title in any sport in decades, will have a shot at the NBA crown Sunday after dropping Golden State on Thursday night. LeBron James of the Cleveland Cavaliers dunks in the first half against the Golden State Warriors in Game 6 of the NBA Finals in Cleveland. The Golden State Warriors had the lowest-scoring quarter of their record-setting season Thursday night, and the Cleveland Cavaliers carried the resulting 20-point lead through the rest of Game 6 of the NBA Finals, winning 115-101. The two teams will play again Sunday night at 8 p.m. ET with the title on the line, broadcast from Oakland, Calif., on ABC. Cleveland was led by yet another dominant performance by LeBron James, who scored 41 points, grabbed 8 rebounds and passed out 11 assists. James had a shaky year shooting from three-point range, but is 7-14 in the past two games. Guard Kyrie Irving had another strong game for the Cavaliers with 23 points, while Tristan Thompson added 16 rebounds. The team is trying to become the first to come back from a 3-1 deficit in the NBA Finals. In the 18 Finals decided by a seventh game, the home team — which will be Golden State — has won 15 times. The Warriors had to play most of the 31-11 first quarter without league MVP Stephen Curry, who was in foul trouble throughout the game and ultimately fouled out for the first time since December 2013. He led the team with 30 points, while fellow guard Klay Thompson added 25. Forward Draymond Green, rejoining Golden State after a one-game suspension, led the Warriors with 10 rebounds and six assists.